Good evening! Hope you’ve been taking advantage of the lovely sunshine today. Have you been enjoying a spot of #SaturdayShopping maybe? Today’s #SaturdayShopping theme is dedicated to gorgeous protective covers for smartphones & laptops. By special request for a friend! Tuff-Luv Polka Hot Case Cover for Kindle by @right_bag – I’m polka dotty for this purple kindle cover @ £26.99. Michael Kors Jet Set Phone Case from @Selfridges – In beautiful bright red, look part of the jet set club @ £40. 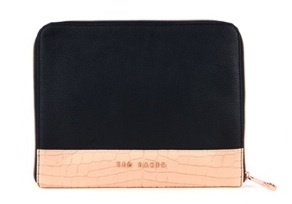 Mockin Contrast iPad Case by @ted_baker – Smart case with contrast of patent leather in neutral colours @ £79. Quilted Acorn Print 13 by @orla_kiely – Stylish classic shoulder bag for 13″ laptop in navy acorn print @ £100.